Following a memorable meal on my first visit to Sushi Tetsu a couple of months ago, I was desperate to go there one last time before my imminent departure to Melbourne. My track record in getting a reservation here had been very poor but that was about to change. I jumped at the news of a last minute cancellation for a Friday lunch and here I was, yet again, immersing myself with more amazing sushi. On this occasion I decided I wanted a bit more freedom to choose from the menu so I opted for the “moon” sushi set (£28) and added four additional sushi’s. Some of the sushi that day was even better than that on my first visit, proving my point that the quality of fish can drastically affect the final product. I was the last person to arrive for the lunch service and things were already in full swing. As always the greeting was very warm and I felt very much at ease despite dining on my own. I spent most of my time chatting with Harumi-san getting some tips on great Japanese restaurants in the Barcelona and the Asia Pacific region. First course for lunch was Sea bass (鱸). The sweetness of the fish was brought out with the touch of home made soy sauce concoction and the green shiso leaf tucked underneath dispelled the fishiness, only leaving the delicious flavour of the fish. Next up was Razor clam (まて貝). The quality of the razor clam was superior to the one I tried on my first visit, evidenced by the additional sweetness oozing out from each bite. I also thought Takahashi-san had really nailed the amount of lemon juice and sea salt to complement the dish. 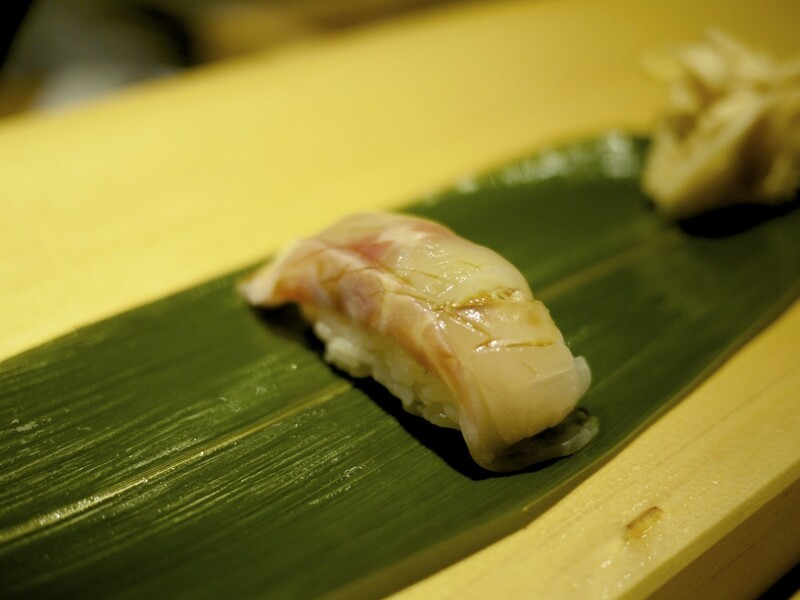 I was excited to see Amberjack (カンパチ) which I had not previously tried at Sushi tetsu. 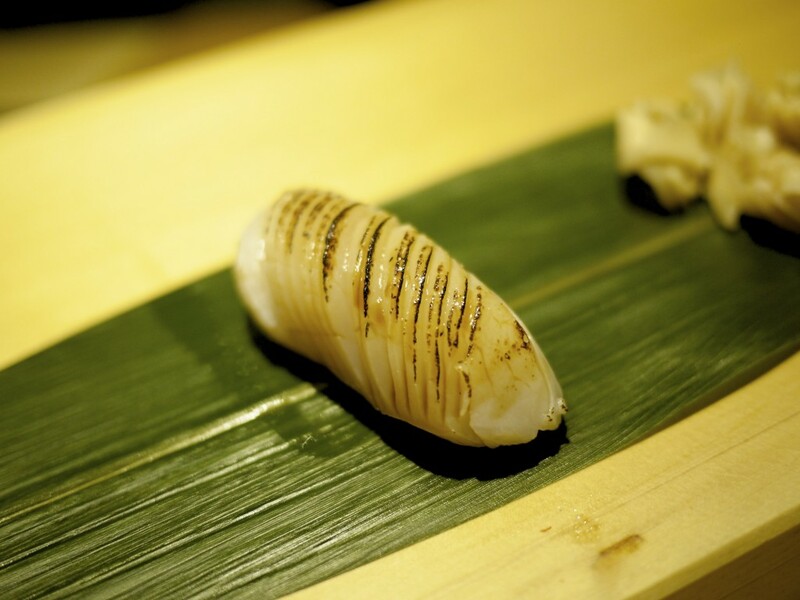 Takahashi-san had imported this luxurious fish fresh from Japan where it was currently in season (summer). 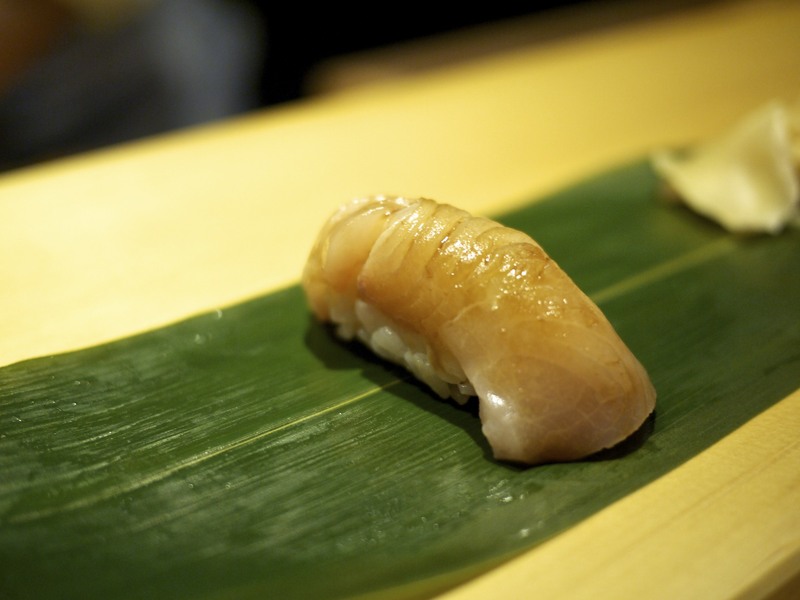 Compared to its cousin of the yellow tail, it was much softer and less oily. It was served again with the right amount of wasab and soy sauce. The Prawn (海老) was similar to my previous visit with a slight hint of smokiness from the blow torch and zestiness from the lemon juice. The Salmon (鮪) was similarly equally as good as the previous visit, served again with slight incisions to plump up the texture of this oily fish. 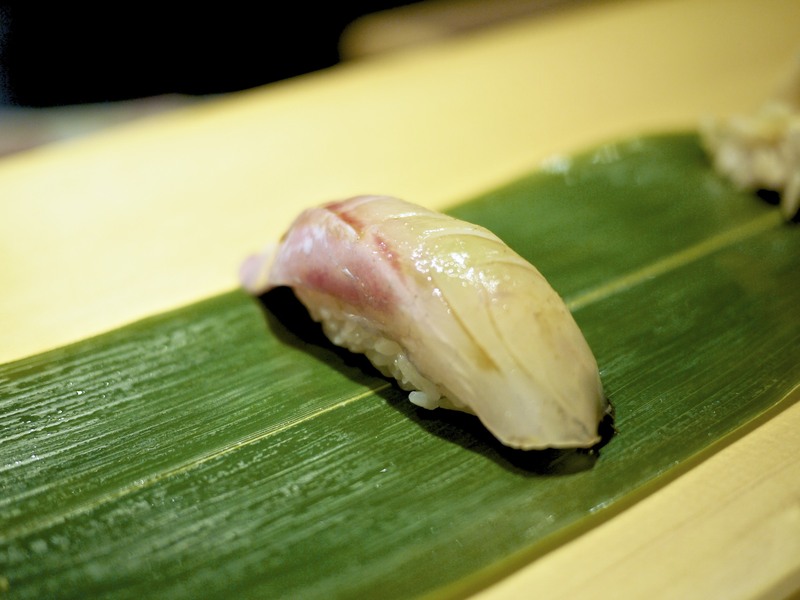 I still reckon it is one of the most understated fish in Japan within the world of sushi. If only more places served them to this quality! I was very glad to see that Akami (赤身) was on the menu again. For those of you who read my previous entry on Sushi Tetsu, I had a tragic moment wolfing down this delicious morsel before realising that I had forgotten to take a photo. Not this time. I could never live this down if it happened again. The cold cut of the akami only had a thin coating of soy sauce, releasing bursts of flavours on each bite. Delicious, refreshing and simple. 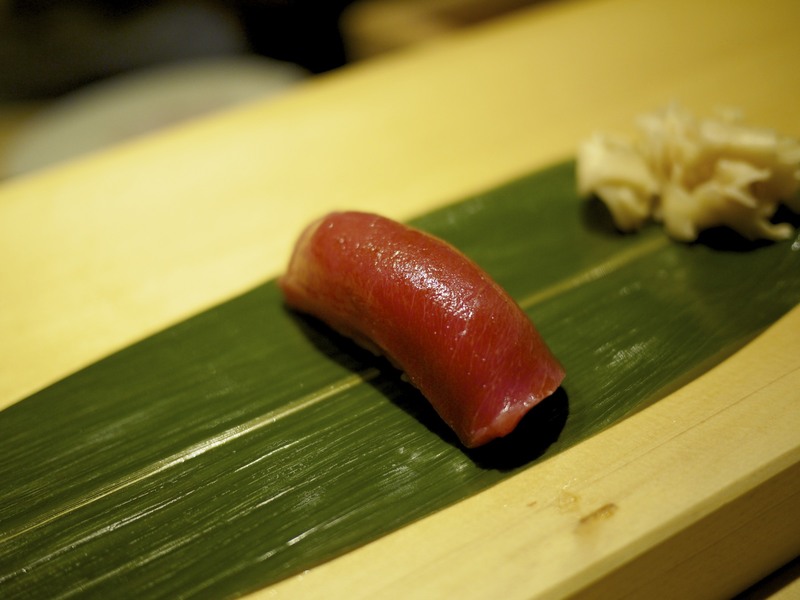 The tuna Takahashi-san sourced was consistently of high quality. It was at this point when I had the chance to deviate from the set menu and try something different. Following Takahashi-san’s recommendation I opted first for the Scallop (帆立貝). I was amazed to see the size of the scallop he had carefully laid out. They were hand dived scallops from Scotland which were meaty on their own but Takahashi-san had added some incisions at an angle to further enhance that plump texture. I couldn’t remember the last time I had a scallop sushi this good. It was very sweet and fragrant, just the way a scallop should be. Next up was my childhood favourite of Salmon roe (イクラ). Takahashi-san had taken the salt away from the salmon roe which had been used to preserve it. He then marinated it in a sauce made from a carefully balanced mixture of mirin and soy sauce. He carefully spooned a few out to place on top of the rice and grated some lime zest. I savoured this moment and tasted each bursting bubble in my mouth as they oozed out the intense and delicious sticky fishy juice inside, perfectly balanced with the lime zest. It was so good my cheeks just swelled up and I couldn’t stop smiling. After savouring my salmon roe sushi which seemed to take an eternity (and I started getting some weird looks from other diners), I saw Takahashi-san preparing my hosomaki… but surely this couldn’t be the end? I still had one more sushi! Seeing how nervous I looked, he reassured me that he had not forgotten my last sushi but that this special hosomaki needed to be consumed before the last sushi due to the richness of the last dish. During the course of the meal, Takahashi-san found out that this was my last meal in London and offered me a special leaving gift of the Toro no Oshinko (とろ沢庵巻). 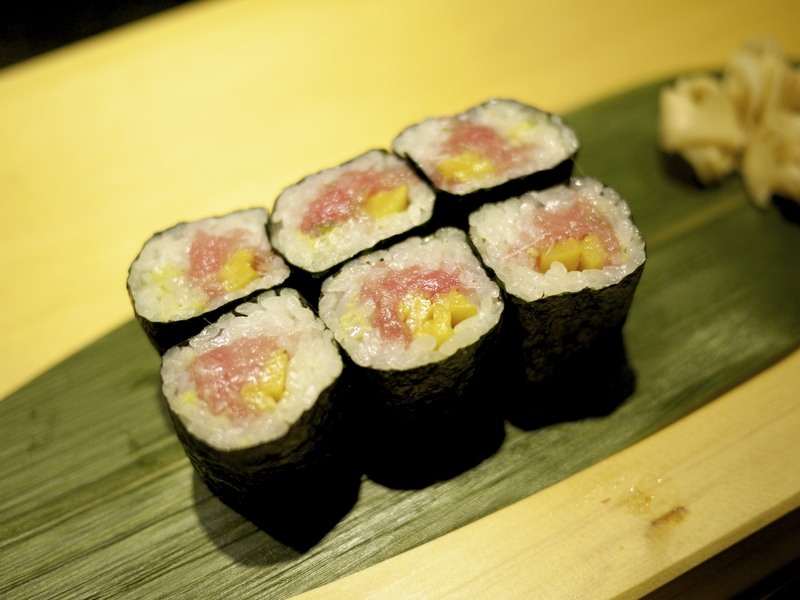 Essentially it was the fattiest part of the tuna (o-toro) that had been minced with spring onion and then wrapped with sesame seed and shinko (pickled radish). It was crunchy and delicious, and I was very touched. I did however wish I had ordered the nigiri of o-toro as well but luckily the next course more than made up for my mistake. I saw the group of four diners next to me order Eel (鰻) earlier on and there was no way I would be leaving the restaurant having caught my olfactory attention with its sweet and seductive smell. The eel was blow torched before the sticky sweet soy based kabayaki (蒲焼) sauce was generously pasted over it with a pinch of sansho. 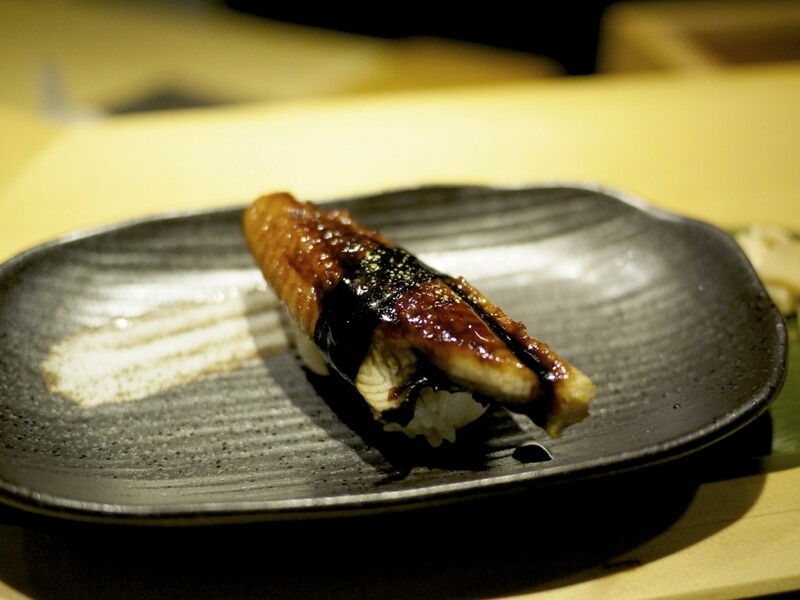 The art of preparing an eel kabayaki requires years of experience as it is technically quite difficult. 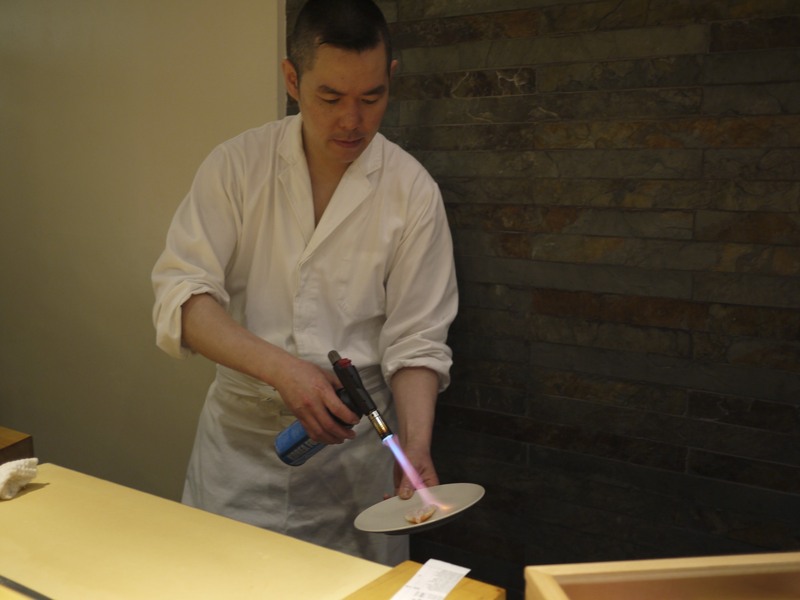 It involves gutting, de-boning, butterflying and filleting the delicate eel, followed by skewering and dipping it into the kabayaki sauce before broiling it on a grill at a temperature which needs to be precise and controlled. I asked Takahashi-san how he had prepared the eel but he only smiled and told me it was a secret… d’oh! Alas, all good things must come to an end (again) and in this case with a Japanese sweet omlette (厚焼き玉子). At first sight it looked like an ordinary puffed up omlette but this one contained prawns, sea bass paste and yam. 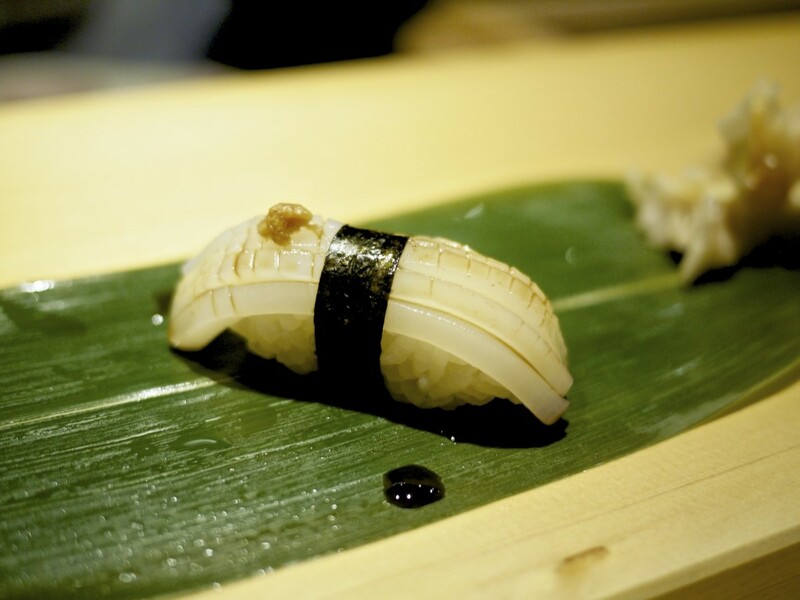 It had an interesting flavour and texture not too dissimilar to that of datemaki (伊達巻き) which contains similar ingredients and is prepared typically for Japanese New Years as part of the Osechi cuisine. This entry was posted in United Kingdom and tagged Clerkenwell, London, Sushi, Sushi Tetsu, Toru Takahashi on July 23, 2013 by admin. I’ve pretty much come to the realisation that if you want amazing sushi you’ll have to go to Japan, or otherwise settle with mediocrity. For this reason I’ve almost abstained in eating sushi outside Japan because all that awaited me after a disappointing meal was a hefty bill, typically fuelled by the copious amounts of beer and sake to soften the blow. It was therefore a stroke of luck when a friend of mine who just returned from a honeymoon in Japan insisted that I should come along to a sushi-ya which she claimed was outstanding. Had it not been for the fact that she had been to some of the best restaurants in Japan recently, I probably would have turned down her offer. Unbeknownst to me, she had become a regular of Sushi Tetsu over the last six months and she assured I wouldn’t be disappointed. Sure enough, she was right. As it turns out, getting a reservation at Sushi Tetsu is ridiculously difficult. 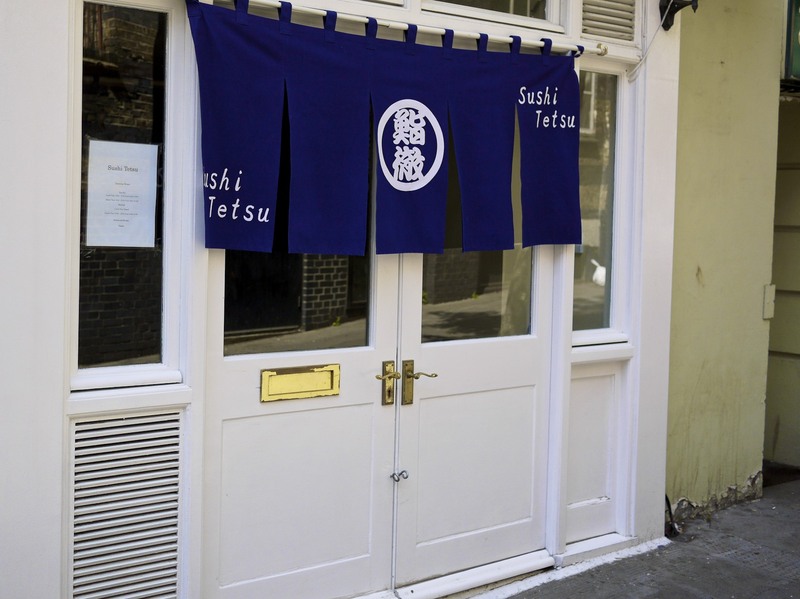 Chef Toru Takahashi who is supported by his wife Harumi in this cosy sushi-ya in the backstreets of Farringdon caters for only seven people during each sitting. Luckily there is the option of filling in last minute cancellations through Harumi-san’s tweets but you’d have to be quick because it goes like gold dust. 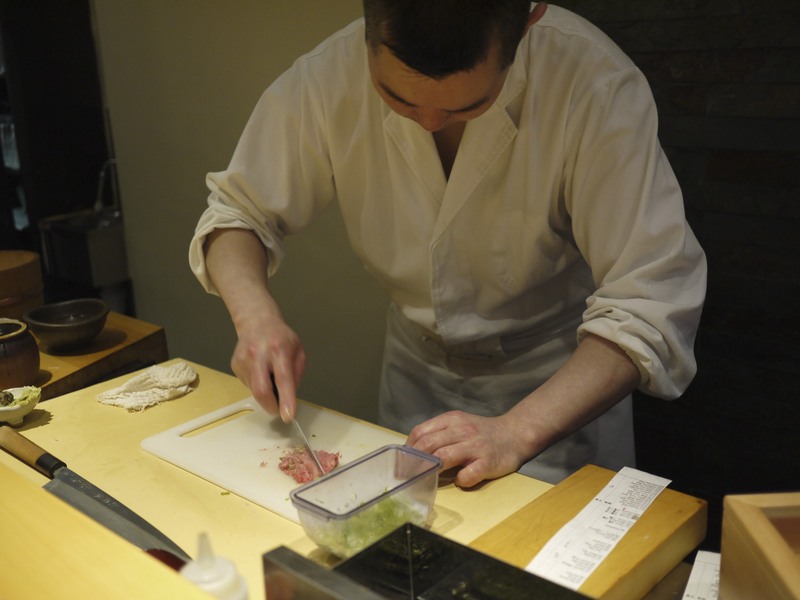 Having picked up the nickname “Tetsu” during his training in Kobe, Takahashi-san trained for five years in Nobu London before going solo on this new venture to concentrate in the perfection of sushi making. I was amazed to find out that Takahashi-san spoke fluent Spanish having lived in Marbella for a year during his chef training years. If you want an elaborate “omakase” menu (chef’s recommendation) ranging up to a reasonable £70, you need to let them know a few in days in advance as it requires a bit of preparation. As I was approaching this cautiously, I decided to opt for just the “Flower” omakase sushi set at £38 to test the water. 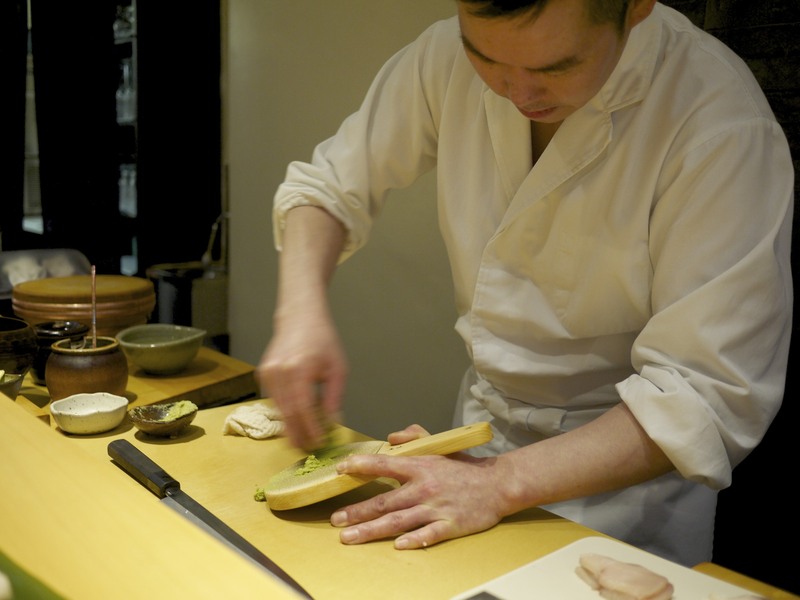 When we entered, Takahashi-san was busy preparing the wasabi for the service. The root was sourced from Shizuoka, a place renown for the best quality wasabi and where the oldest wasabi farm can be found. Harumi-san first brought out some wet towels whilst her husband laid out the bamboo leaves in front of us where he would serve the sushi one by one. It took only one sushi to realise my mistake in not ordering the omakase menu. I immediately knew I had to come back… soon. The fish here is sourced through a trustworthy Japanese distributor who picks out the best fresh fish from Billingsgate market every morning. 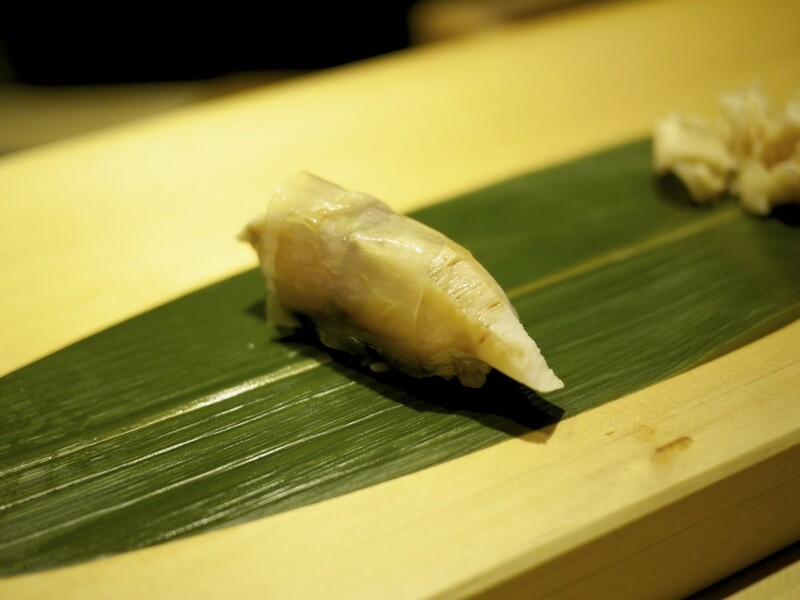 The first course of the meal was Sea bream (鯛), sourced most likely from the northern European seas. The firmness of the flesh was unbelievable yet it retained a good level of moisture. 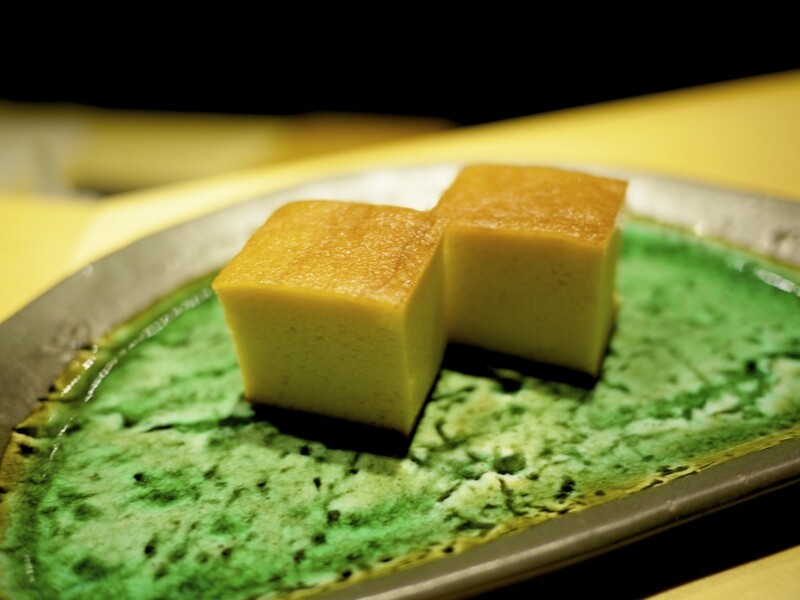 It had the right amount of the Takahashi-san’s home made soy concoction brushed on to complement the natural sweetness of the fish for which it is prized for, ending with a refreshing note of mintiness from the discretely hidden shiso leaf. The rice was spot on at body temperature and the right amount of pressure applied to form the pellet, firm but not too compact; something which requires years of training and the first hurdle for all trainees to becoming an “itamae” (板前), i.e. the chef. Takahashi-san smiled back as I couldn’t contain my joy. He then moved on to wipe the bamboo leaf and began preparing our next course, Spear squid (槍烏賊). It was soft and sweet, although it did have a slight bit of chewiness. 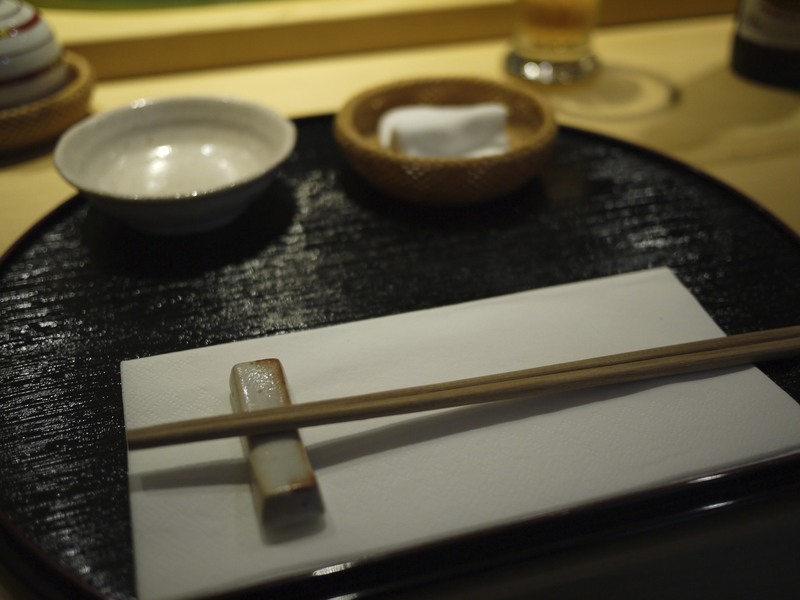 The chef uses two types of nori, including Maruyama Nori which has been produced since 1854 during the Edo period and coincidentally also used by the ever so famous Sukibayashi Jiro. 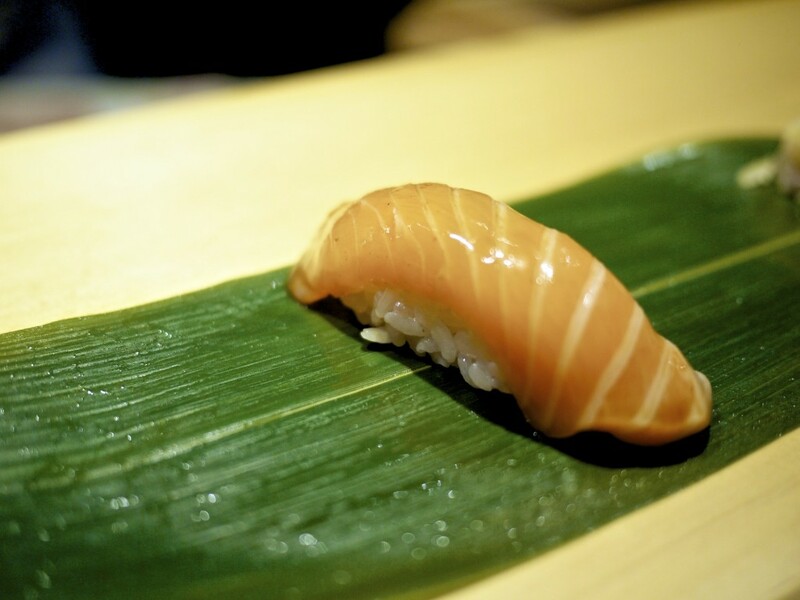 After another wipe down of the bamboo sheet, Takahashi-san was on to the next nigiri of Salmon (鮪). It’s perhaps not construed to be the most exciting cut of fish but I can assure you that when you get it right, it can be very good. 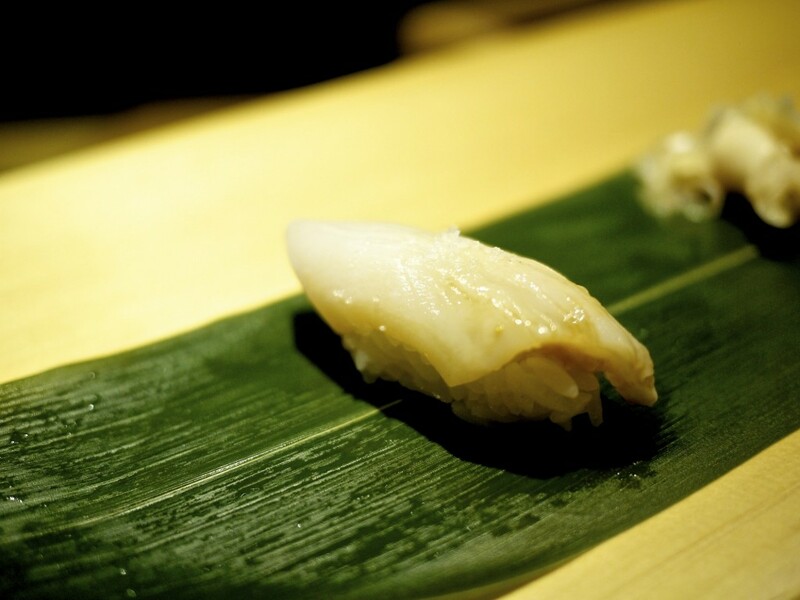 The superior quality was evident and combined with the chef’s masterful skill this piece of oily silky fish simply melted in your mouth. 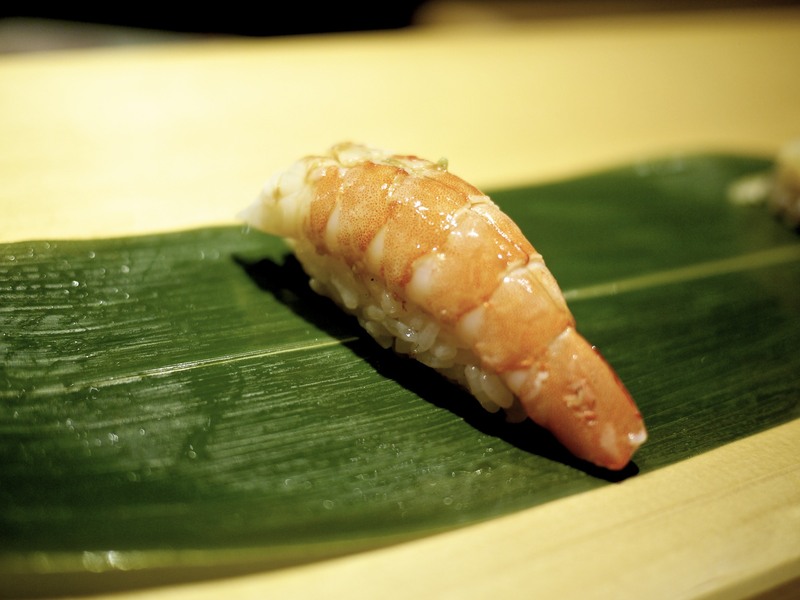 The delicious morsels of sushi kept on coming and the next nigiri of Prawn (海老) was no exception. 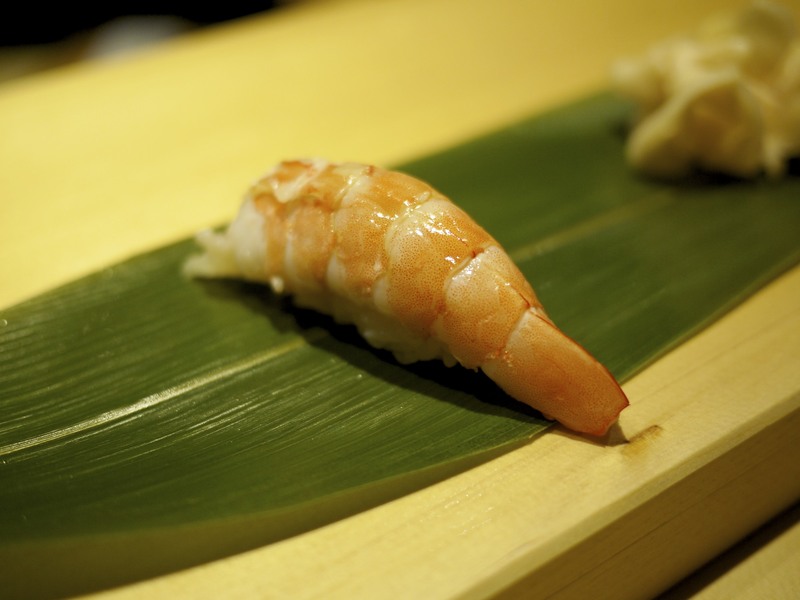 The prawn was boiled very slightly and subsequently blow-torched on the butterfly-cut side to enhance the flavour and texture. It was sweet with a small hint of smokiness, but most importantly juicy and flavoursome. Next up was one of my favourite of all times, Yellow Tail (ハマチ). Judging by the oiliness, softness and time of the year, I believe this particular cut was from a farmed fish in Japan as the natural ones are more firm, lighter in oil content and typically caught in winter. As far as I’m aware I don’t think they are native to the European seas but I’m more than happy to be corrected. It’s really a personal taste as some people, like myself, prefer the oily farmed ones. I thought this particular one prepared by Takahashi-san was very good with a lovely sweetness coming through, thereby requiring less soy sauce than similar white fleshed fish. 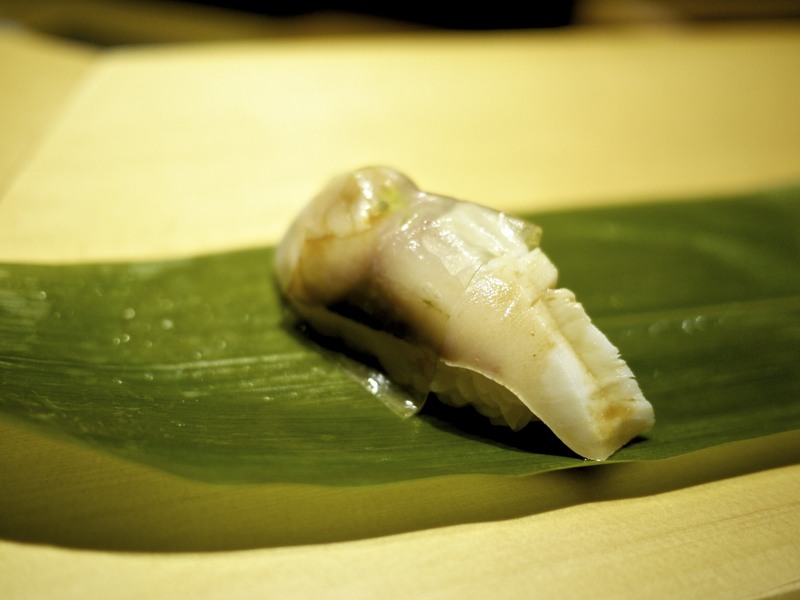 Razor clam (まて貝). After blanching the clam and cleaning it thoroughly, very shallow incisions were made across to give it a plumper texture. It was then glazed lightly with some more homemade soy sauce, dressed with an ever so tiny pinch of sea salt, and I could also pick up a hint of citrus note, possibly from the use of sudachi or ponzu which are the traditional choice. 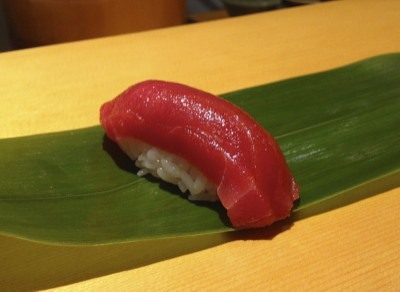 There is a Japanese saying in that if you want to really test the quality of the tuna of a sushi-ya, the best part to first have is the lean cut, Akami (赤身), i.e. the red meat. There is much less distraction in flavour from the oiliness found in the more expensive fatty parts of the tuna. Provided the red meat passes muster, you can proceed to order the more expensive cuts as chances are it would be of supreme quality. What happened to me here was tragic and slightly embarrassing. The akami looked so good I forgot to take a photo and just gulped it, ending with a mixed emotion of happiness and remorse. Setting my stupidity aside, the akami was very good. It was soft and released so much flavour on each bite. It was evident that the tuna was wild as opposed to farmed. I can’t remember the last time I had such a good akami. I could hardly contain myself thinking about how the o-toro would taste! (special thanks to Fine Dining Explorer for supplying the photo). The next course of Black Amberjack (黒カンパチ) was rather a surprise as it’s not a very common fish, at least in Japan. 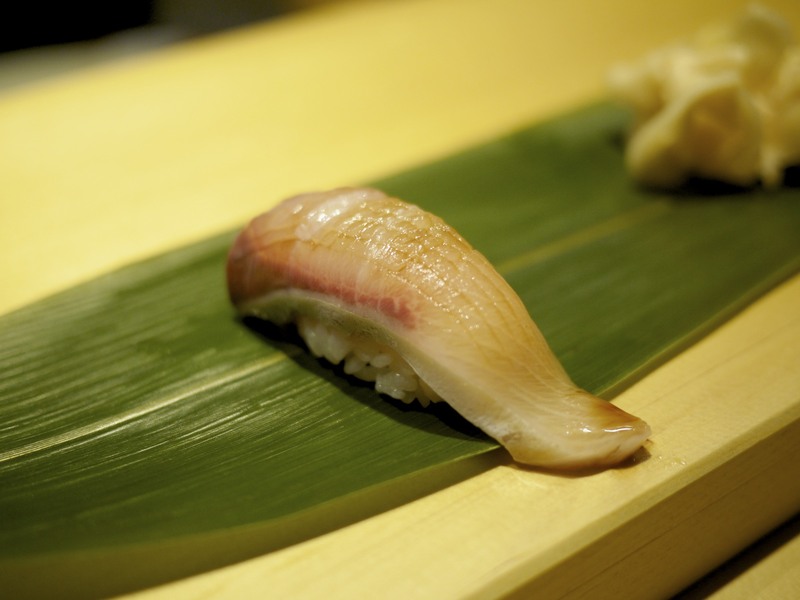 Given the similarity in name, texture and appearance to amberjack (kampachi), this fish has recently had to have its name changed in Japan to Sugi (スギ) due to people being tricked after thinking they bought the more expensive kampachi. Whilst a cheaper substitute, the taste is not inferior and it is much more fatty than the kampachi. I quite enjoyed it, particularly given this was my first time trying it. Finally on to the much anticipated Aburi o-toro (炙り大トロ), the fattiest part of the tuna. After tasting the akami, I knew this was going to be something extraordinary and sure enough it was. The piece of fish was again lightly slashed and then brushed with the soy sauce concoction before being seared with a blow torch. To finish off, more soy sauce was brushed and it was ready to be devoured. It was a beautifully smoky morsel with an intense flavour that followed as the fish melted like butter in your mouth. Phenomenal. The last of the nigiri was a marinated Mackerel (鯖), which had a sheet of thinly sliced su-konbu (seaweed marinated in vinegar). 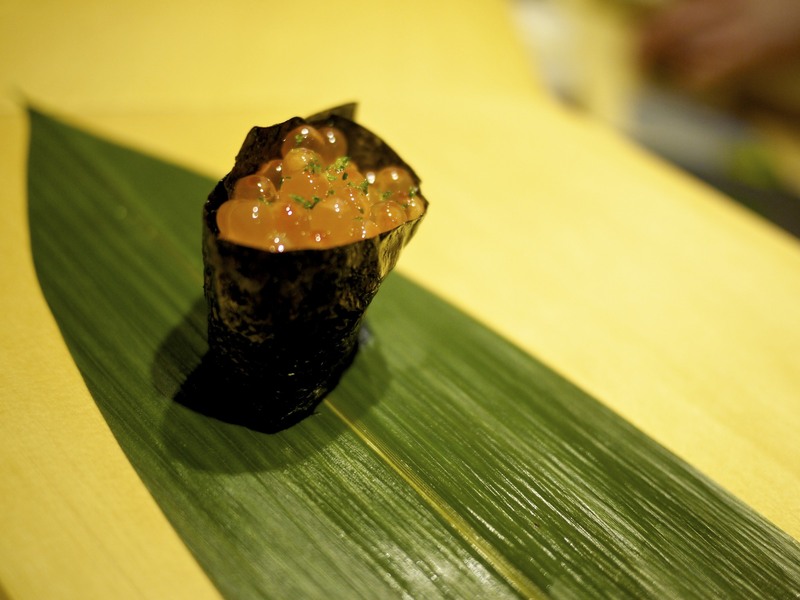 Umami, which is the savoury flavour found in konbu, is regarded as one of the five basic tastes of Japanese cuisine. 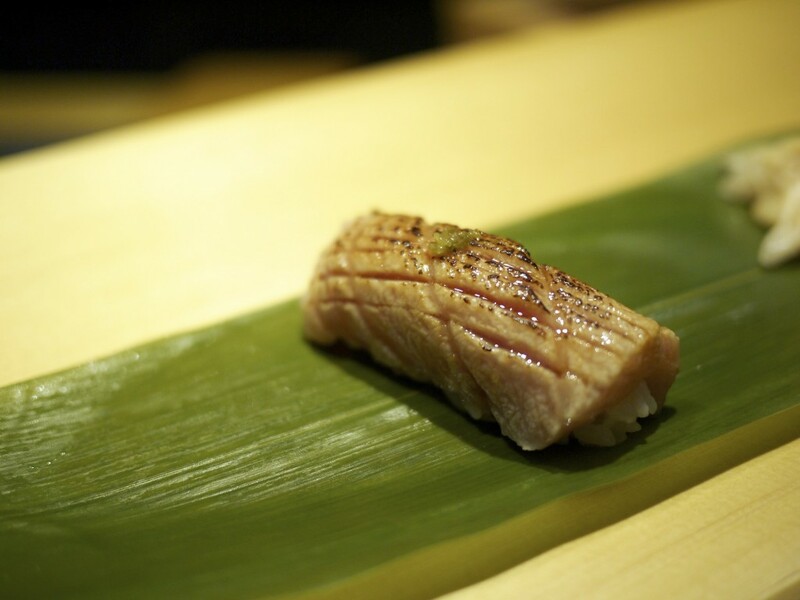 The konbu gave the oily fish a meaty depth and the vinegar removed the fishiness typically found in the aftertaste. It’s a very delicate fish that requires quite a bit of skill to fillet and is one of my all time favourite fish despite it being relatively unpopular. Last on the menu was a hoso-maki (細巻き) of Yellow tail with spring onion and shichimi (seven spices), salmon and razor clam with shiso. I particularly liked the yellow tail with the heat coming from the shichimi. So there you go. 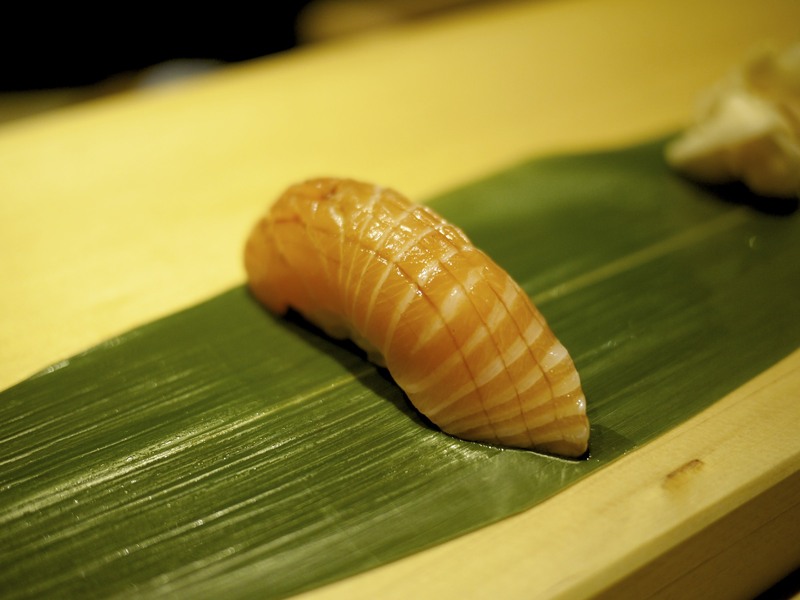 You can actually get top quality sushi outside Japan and Takahashi-san is the living proof. 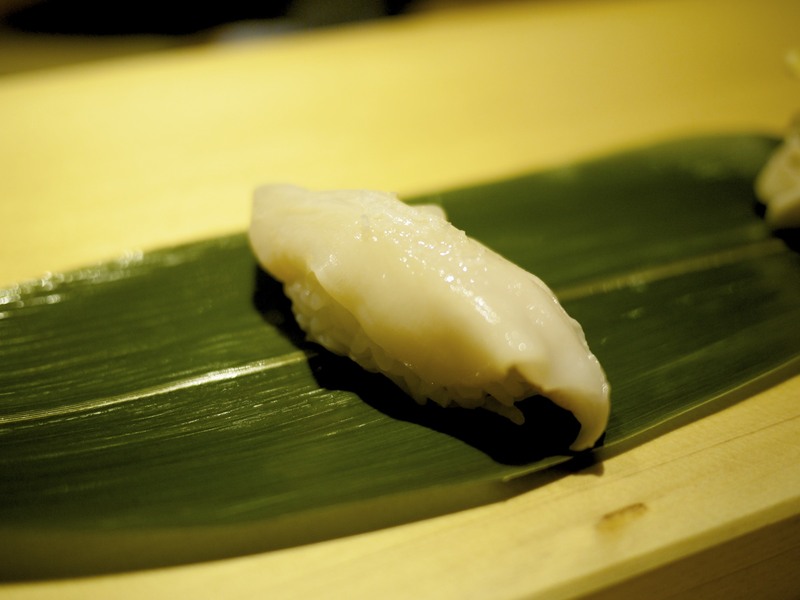 But in order to get a successful sushi-ya you need some fundamental elements which most sushi-ya’s outside Japan lack. First and foremost, you need to have or rely on someone who has the skill of “mekiki” (目利き), which is the ability and knowledge to pick out good quality fish. Without good “sushi neta” (寿司ネタ), i.e. 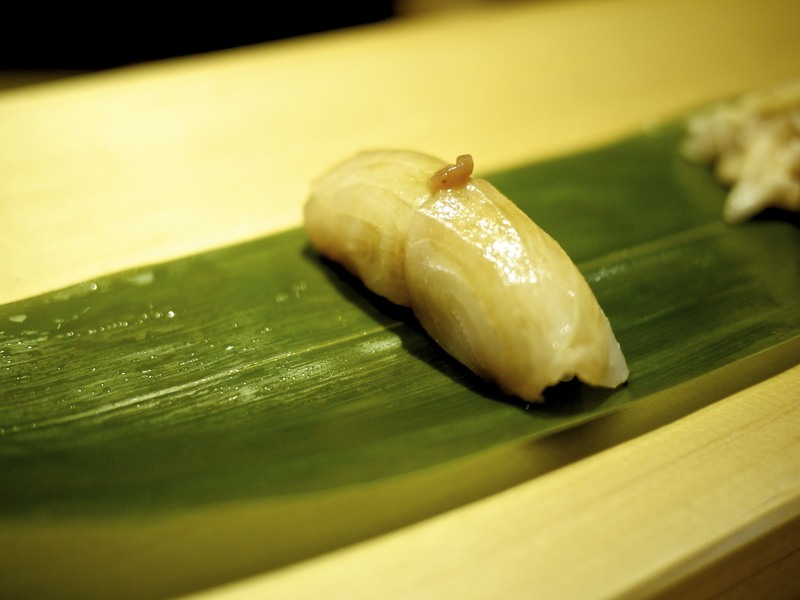 the toppings such as fish, even the most skilled itamae will struggle to make something decent. After that comes the extremely important skill in the preparation of the sushi rice (temperature and perfect balance of vinegar, sugar and salt), and its application where too much or little will affect the balance of flavour, and most importantly the right level of pressure needs to be applied; too little and the pelet falls apart, too much and it becomes hard. Then comes the matter of sourcing good quality nori, wasabi, knives and getting your homemade sauces right. Finally, you need someone with years of experience to bring all the elements together. It’s an art that requires discipline and unwavering determination, two qualities I believe Takahashi-san has and rewarded him in my opinion with the best sushi-ya in Europe. The road to perfection in the art of sushi is endless and no doubt Takahashi-san will go far as he continues to polish his skills. I can’t wait to go back! 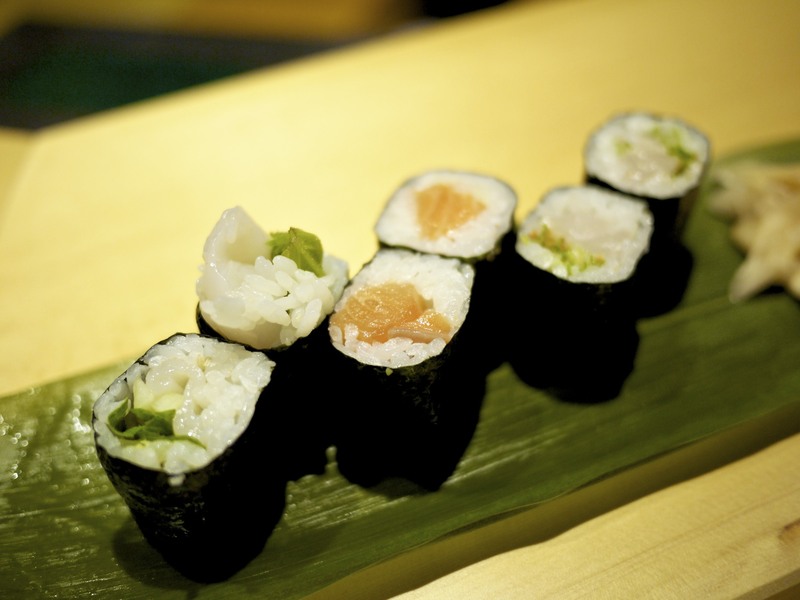 This entry was posted in United Kingdom and tagged Clerkenwell, Sushi, Sushi Tetsu, Toru Takahashi on June 13, 2013 by admin.